In the case of Sonic Evolution, the collaboration takes two forms. First, world premieres by acclaimed young composers from all over the world, whom the symphony commissions to write entirely new pieces that pay tribute to Seattle’s ongoing music heritage. Past events have featured stunning original work based on the music of Jimi Hendrix, Kurt Cobain, Quincy Jones, Alice in Chains and Blue Scholars. Next year’s plans include a composition based on Pearl Jam’s oeuvre, and Macklemore is on the list of options for future iterations. While this might sound counterintuitive to fans (“Just play the hits!”), at previous Sonic Evolution shows, the tactic has proved a huge success—thanks especially to Morlot’s selection of highly inventive composers. Listeners are treated to complex new soundscapes that honor and echo the source material (a familiar chord here, a scrap of reminiscent rhythm there) without being enslaved by it. The second component of Sonic Evolution is live performance by an up-and-coming local band, which plays several of its own songs as orchestrated for the full symphony. Star Anna and Hey Marseilles received this honor at the previous two installments, and this year is a special case—with both Sir Mix-A-Lot (whose real name is Anthony Ray) and soul-inflected indie rock band Pickwick performing songs (orchestrated by Prokofiev and composer David Campbell, respectively) upstage as the Grammy-nominated orchestra plays along right behind them. The intention of all this, Morlot says, is to “expand the symphonic repertoire by commissioning young composers, and give attention to the Seattle music scene by collaborating with local bands.” He emphasizes that all the musicians involved—the composers, invited performers and symphony players—benefit in this scenario, because everyone brings some piece of the experience back to their own music making. Sir Mix-A-Lot knows exactly what he means. “You hear things really differently when you’re coming from a different genre,” he says. “And I always incorporate the new sounds I hear into my music.” Sir Mix-A-Lot is thrilled by what he’s heard so far of Prokofiev’s orchestration. “The integrity of the song is there, but it sounds huge,” he marvels. A portion of the crowd will attend Sonic Evolution specifically to hear Sir Mix-A-Lot—in whatever form—which is, of course, part of the impetus behind the program: to bring new audiences to the symphony. 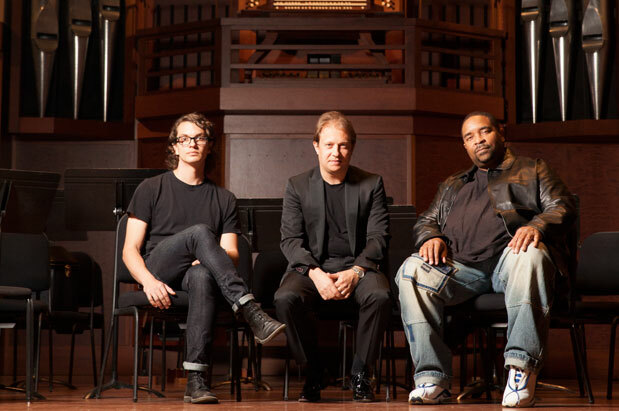 “It’s exciting because some people will come for Sir Mix-A-Lot, some will come for Pickwick, some will come because they are eager to hear the new voices of the young composers,” says Morlot. “These audiences are always very mixed.” The symphony reports that single-ticket buyers, which include new attendees, make up about 22 percent of the Sonic Evolution audience. Approximately 29 percent of these new attendees will return for other symphony concerts.